You are here: Home > PowerPUC-G5, Wheel Lighting Kits. > PowerPUC-G5, Single Color Kits. Kit includes everything you need to create outrageous designs directly on your wheels! Bring light to your wheels and be the center of attention wherever you go. Create wild effects with included Multi-Function Remote. New EZ-Wiring Backbone and EZ-PUC Mount** make installation virtually plug-and-play! 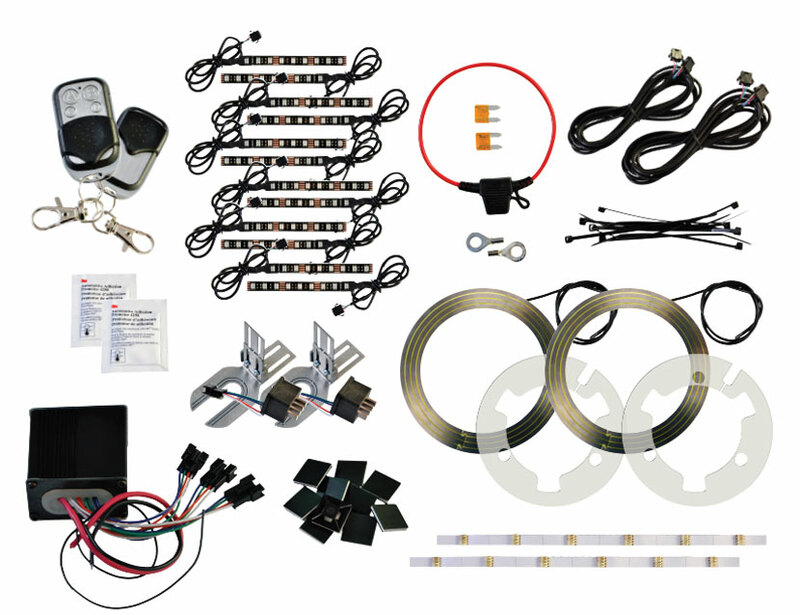 Includes G5 PowerPuc Basic Kit, 12 strips of 1 Color LED's. Each strip contains 9 leds and is 5" long. (108 total LEDS!) A powerful Multi-Function Remote with literally dozens of control functions. The SCMF remote is one of the most powerful remote controllers available. Multiple strobe, flash, fade, breathe and an On/Off. Functions can be controlled up to 150 feet away. Comes with 2 key fobs. **EZ-Mount is available for most bikes. To determine if available for your bike, enter the Make, Model, Year and options into the "Kit Finder". If the resulting Kit Code begins with a letter it will include the adapter. If it begins with a number, no adapter is included and PUC Ring will need to be installed "Old School".See Instructions. Use the kit finder to identify which kit will fit your motorcycle.